Appendicular bones: The bones which make up the rest of the skeletal system after the axial bones include the bones found in the upper limbs (arms), lower limbs (legs), shoulders and the pelvis. Medullary cavity: The innermost part of the bone which holds bone marrow. Range of motion: The specific movements or motions that each muscle is capable of. Pathological fracture: A fracture that results from a disease process rather than undue stress or trauma as other fractures do. Transverse fracture: A fracture that occurs straight across the fractured bone. Osteoarthritis: The type of arthritis that primarily affects the older population as their joints age, wear and tear. Diagram of the front of the human skeleton. Diagram of the rear view of the human skeleton. The skeletal system among adult human beings has 206 bones; some of these bones, like the femur of the upper leg, are quite large and others, like the phalanges of the toes, are quite small, as shown in the picture above. 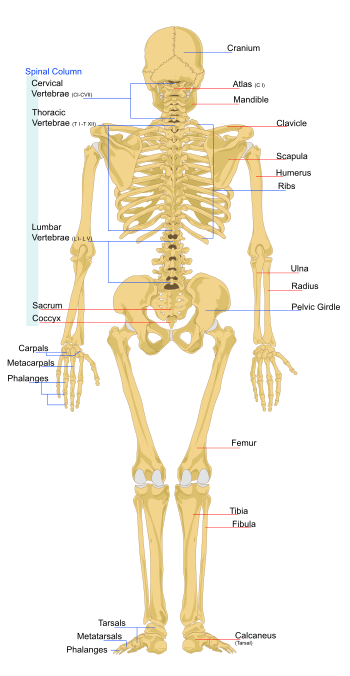 Appendicular bones which make up rest of the skeletal system including the bones found in the upper limbs (arms), lower limbs (legs), shoulders and the pelvis. 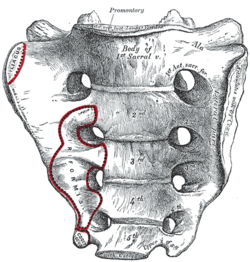 Position of femur (shown in red). 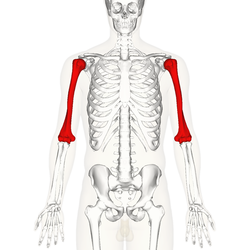 Position of humerus (shown in red) from an anterior viewpoint. A coccyx with four vertebrae below the sacrum. Cross section showing cancellous bone. 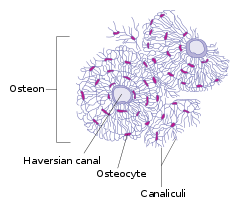 Diagram of cross-section of cortical bone showing osteocytes and osteon. Cortical bone, which is the stronger of these two types of bone, is the kind of bone that is most needed for bodily support and bodily movement. Endosteum covers the inside of bones, and surrounds the medullary cavity. The medullary cavity which is the innermost part of the bone which holds bone marrow. Osteocytes are the cells that are the building blocks of the bone. Osteocytes form the inner matrix of bone tissue that gives bones their strength. Osteoclasts perform the normal cyclical process that maintains the integrity and strength of the bones. Osteoclasts break down bone and reabsorb it so that the bones can renew with remodeling and repair. Osteoblasts follow the osteoclasts in terms of the normal process that maintains the integrity and strength of the bones. Osteoblasts build new remodeled bones by producing new collagen and building new bone minerals so that the osteocyte can remain healthy and in good functioning condition. Stem cells, which are also called osteogenic cells, form in the inner surface of the bone and they are somewhat immature osteoblasts that will later transform into osteoblasts. Lastly, lining cells protect the bones and they also release calcium into the blood when the blood calcium levels are low. 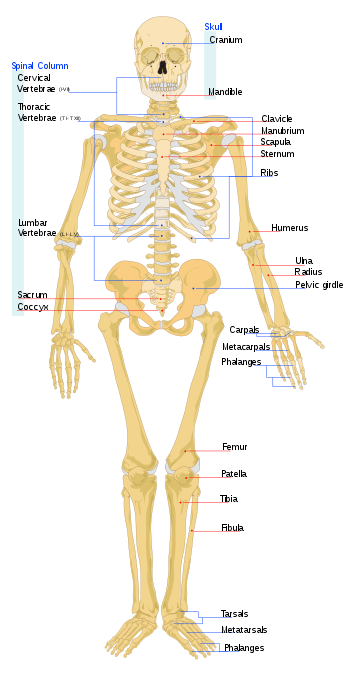 The human skeleton and the skeletal system perform several functions. Cartilage is less hard than bones and it is more flexible than bone, however, cartilage is smooth and it forms a smooth surface. It is because of this characteristic that cartilage plays a highly important role in the protection of the ends of the bones and cartilage also gives bones a smooth surface over which bones can smoothly articulate with other bones during bodily movements. For example, the cartilage at the end of the femur provides a smooth surface so that, when it moves with the hip during ambulation for example, the cartilage enables smooth movement. You have seen cartilage many times in your life. Cartilage is seen at the end of chicken bones like the leg and the thigh of the chicken. Unlike bones, cartilage does not have a blood supply; it also does not have nerves. 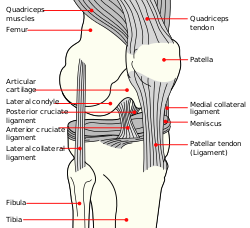 Diagram of the right knee showing ligaments and tendons. Ligaments, like tendons are made up of connective tissue with collagen. 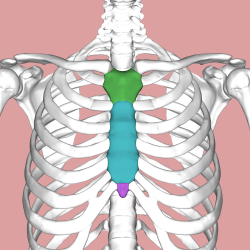 Ligaments connect bones to bones at the point where they articulate or come in close proximity to each other, often touching the cartilaginous ends of the bones at the point of articulation, as shown in the picture above. 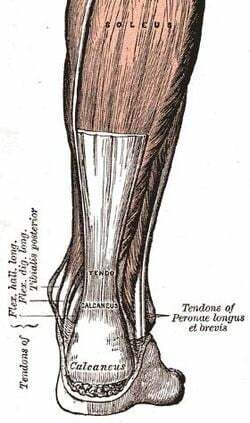 The Achilles tendon, one of the tendons in the human body. Tendons are connective tissues with collagen that connect bones to muscles and allow joint movement, as shown in the picture above. 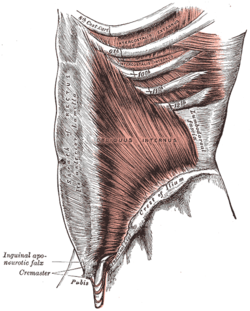 Fascia, also made of connective tissue, connects muscles to other muscles. Although fascia is technically a part of the muscular system when the muscular system is separated from the skeletal system rather than combined as the skeletomuscular system, it is being covered here because the composition of fascia is the same as that of tendons and ligaments and fascia plays a similar role in terms of bodily mobility and movement. Skeletal fractures are commonly occurring skeletal injuries. Skeletal fractures are classified and described in several ways, many of which are not mutually exclusive. A complete fracture involves the entire cross section of the fractured bone; an incomplete fracture affects only part of the bone and not the entire cross section; stable fractures are defined as fractures that are not likely to be displaced, therefore, reduction is not indicated; an unstable fracture, unlike a stable fracture, necessitates reduction because it is likely that this fracture is displaced; a closed fracture is defined as one that does not break through the surface of the skin and this type of fracture and this type of fracture is also referred to as a simple fracture; an opened fracture, on the other hand, breaks through the skin surface to the exterior of the body and, as such, an opened fracture is prone to infection because the skin lacks integrity; and a pathological fracture is one that results from a disease process rather than undue stress or trauma as other fractures do. 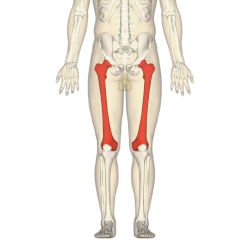 Fractures can also be categorized and categorized according to it pattern. A greenstick fracture occurs when only one side of the bone is fractured. An avulsion fracture occurs when a fragment of the fractured bone is pulled off the bone at its tendon or ligamentous attachment. A comminuted fracture is one that splinters the fractured bone into small fragments as a result of a traumatic force. A transverse fracture is one that occurs straight across the fractured bone. An oblique fracture is one that occurs at an angle across the fractured bone. A spiral fracture occurs when the pattern twists around the fractured bone. An impacted fracture is one that occurs when a bone fragment of the fractured bone is pushed and wedged into another bone fragment of the fractured bone. Compression fractures occur when the fractured bone collapses as occurs with vertebral spinal fractures. A depressed fracture occurs when bone fragments of the fractured bone is pushed in beyond the surrounding skin. This type of fracture occurs with depressed skull fractures. Brief Description: Dislocations and subluxations occur as the result of a traumatic injury; a dislocation occurs when the joints, or their articular surfaces of the bones, are completely separated and are no longer articulated and connected with each other; and a subluxation is only a partial, rather than a complete, displacement and separation of the joints or articular surfaces.